Remember when Phillies first baseman and heavy hitter Ryan Howard crumpled on the field last October during a game against St Louis? He ruptured his left Achilles tendon, which required surgery soon after the injury. As any Phillies fan knows, Howard is still rehabbing from that injury. In part, the long rehab time is due to a second surgery he required when an infection developed at the site of the first surgery. Trade rumors are running rampant, as Howard’s Achilles injury could permanently hamper his performance and spell the end of his amazing career. But I’m sure Charlie Manuel and the rest of the Phils’ staff won’t make any decisions on trading Howard until they see how he performs on the field. But boy, do they need the pre-injury Ryan Howard now. The Phils have been plagued with injured superstars this year, including Chase Utley and most recently Roy “Doc” Halladay. Meanwhile, they’re in the cellar of the NL East – 8 games behind 1st place Washington. July-that’s about nine months since he injured himself. 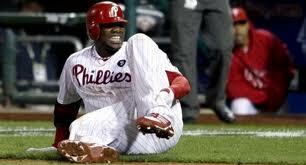 Ryan Howard was in superior physical condition when he ruptured his Achilles tendon. This shows how easily you can injure yourself and how important it is to keep your legs, feet and ankles in as good physical condition as possible. You probably won’t be putting strain on your Achilles to the degree that Howard did, but if you jump back into running, softball, basketball, touch football, tennis, skiing, or any sport after laying off for awhile, proper conditioning is absolutley critical to protecting all of your working parts. Remember to stretch before and after physical activity – beforehand to warm up your muscles, tendons and ligaments and afterwards to cool down those same areas. Warming up helps to reduce muscle stiffness which is thought to be directly related to muscle injury and cooling down helps dissipate waste products from your muscles, reduces adrenaline, and allows your heart rate to return to its resting rate. Check out these basic stretching exercises which are really simple and effective. As always, if you experience any pain or unusual stiffness in your feet, toes, or ankles make an appointment with PA Foot and Ankle Associates for a thorough examination and diagnosis. PAFAA is expert at treating sports injuries and will develop a custom treatment plan specific to your injury. ← My child has flat feet – what should I do?